We gave you details of some progress made in Sohm during our recent visit to the Gambia in our last (March) newsletter, and promised more in this one. So, here goes! In addition to providing teacher training for the schools in Sohm, establishing a book fund and cementing school twinning arrangements, reported last time, we are delighted to update you on a few more areas of activity. Our friends at the UK charity, Football Gambia, paid a day visit to Sohm and provided a fun day of football and general sports training and activity for the village and its two schools. Forty plus UK volunteers descended on the village and offered football training skills to the Senior Secondary school, and a variety of outdoor education games to the pupils in the Lower Basic school. A great time was had by all, and Football Gambia crowned their contribution to the day by giving 40 sets of England and Liverpool football kits and footballs to the Senior school, donated by Kit Aid, and a range of outdoor play equipment to the Lower Basic school. Their efforts were much appreciated by students and staff of both schools, ourselves and the country's regional director of Education, who felt it added greatly to the physical education the pupils receive in Sohm. A dozen friends, relatives and supporters of Sohm Schools Support sponsor the education of students at the two schools. We have changed some of the sponsorship arrangements, which we believe will make things easier for sponsors and more beneficial for the two schools. School fees vary from year to year, and sometimes there are external exam fees to find - which means that sponsorship requests move up and down over the period of a student's education. We think this makes things difficult for sponsors, so we have equalised things out, so that from now on sponsorship will be a flat commitment of £5 per month (£60 per year - which is topped up by another £15, as a result of the government's Gift Aid Scheme). For ease of administration we'd prefer that this sum was paid by Standing Order (monthly, quarterly or annually). An element of sponsorship money pays for books. Until now, those books have been given to the sponsored student. We are changing the system so that the book, although used by the student, belongs to the school - so that it can be passed down to students in successive years. This has taken a bit of persuading and arranging, all round - but we think that everybody we have talked to, in both the UK and The Gambia, is happy with the new arrangements. All sponsors will now receive a 5" x 7" photo of their student, a letter of thanks from that student and a copy of the student's annual report - as part of the sponsorship arrangements. We hope you approve of the new, simplified, system and would consider sponsoring a student's education - and making a difference to their life - for the price of a couple of alcoholic drinks, or designer coffees, per month. Many of the pupils at Sohm's two schools walk for over an hour each way in searing heat, to and from school each day. Thanks to the generosity of UK charity Jole Riders, the schools were given 100 bikes three years ago, to make life a bit easier for those living furthest away from the schools. 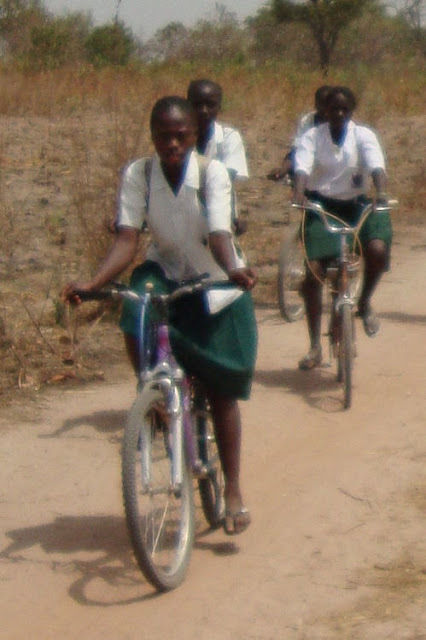 The schools make a small rental charge (about £1.50 per term) for these bikes, to provide a small repairs budget. Many students can't afford that small sum, however. And, some of the bikes are getting a bit beyond the "small repairs" stage (there are no cycle lanes or tarmac roads to ride on! ), so some of them have fallen into more serious disrepair, to the detriment of those who need them to cut down on school journey time. Thanks to the generosity of Bill Carson, we have established a Bike Fund. This is being used to top up the rental income and fix the more damaged bikes. As a result we have been able to get 12 badly damaged bikes back on the road. Bill has agreed to extend his generosity by helping us with our own version of a Red Letter Day present. You can give a "Middle Aged Crisis" man or woman of your choice and hour on the back of Bill's Harley Davidson - Rock 'n Roll a blarin' (if that's your choice) - on a route of your choosing, within the Greater London area, at a mutually convenient time. He'll pick the recipient up, provide leathers (to a wide range of sizes), follow his/her chosen route and return them to the start point. All, for a remarkable £50! Bill will donate the whole sum, after petrol costs, to the Sohm Bike Fund. So - make a middle aged person very happy (and we're not just talking about Bill), and some Gambian youngsters mobile with this special treat. Just contact us by the means shown at the end of this newsletter to make a difference!